I had a request, recently, for more information on how to make yogurt for dirt cheap. 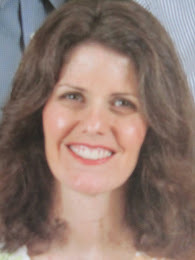 So, I thought I'd share what I do, and what I've found that works for me. The primary cost, the whole milk, I look for on mark down (the milk that is close to it's sell-by date). Turning milk into yogurt extends the life of that milk. So, if there's just 1 week before the sell-by date on the milk, I know that I can make it into yogurt the next day, and have the yogurt still be good for another few weeks. Traditionally, yogurt-making was a simple food preservation technique. The yogurt contains cultures which produce lactic acid, which in turn retards spoilage of milk (see here, article in Mother Earth News). So, buying whole milk when marked down due to nearing the sell-by date, is my first step in making yogurt for dirt cheap (most of the time, I spend under $2 for a gallon of whole milk, which makes 3 1/2 quarts of thick yogurt). If I find more whole milk on discount, than I need for yogurt-making right away, I freeze the milk, and make yogurt at a later date. My second step for dirt cheap yogurt is free yogurt starter. I've been making yogurt for 2 1/2 years now, about 2 times per month. For my first batch, I bought one 6-oz container of Yoplait vanilla yogurt for 39 cents. I've been using descendants of that first batch for about 50 batches, now. Based on a price of 39 cents per container of Yoplait, I've saved over $19 on yogurt starter. What's my secret? I have a method that seems to work for me. I freeze my own homemade yogurt as starter for successive batches. Some people chain-yogurt (using a bit from each previous batch to make the current batch). I prefer to freeze my starter, in quantities enough to make several batches. The advantage, here, is that if I don't get around to making a new batch of yogurt for a few weeks, I have viable starter waiting for me in the freezer. 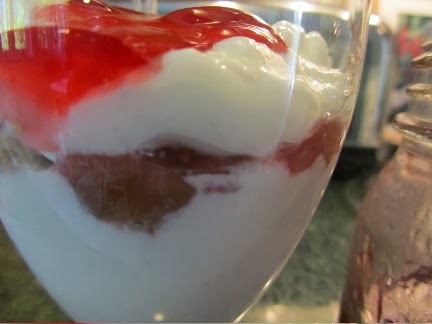 Yogurt cultures only remain viable in the fridge for about a week to 10 days. 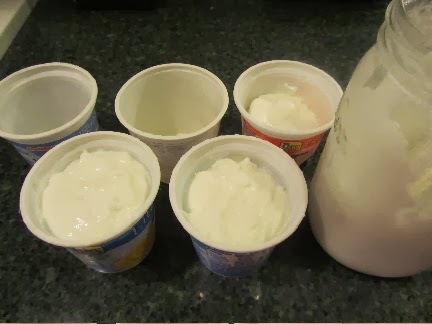 Every 4 or 5 batches, the day immediately after making a fresh batch (after I'm sure it has set), I scoop 6 ounces of yogurt into 5 or 6 freezer containers. I label and date each container. Frozen yogurt can remain viable for many months in the freezer, but why push it. 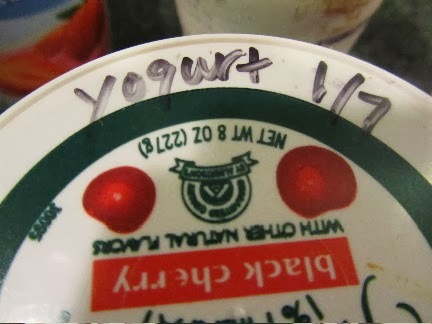 This last batch (1/6/14) was made with yogurt dated June 2013. So, I know for sure that my freezing methods work for 6 to 7 months, from the point of incubating to the point of using it as starter. I keep these containers of starter in a 0 degree F freezer. I never let myself use the last container of frozen yogurt, but always keep one in reserve, just in case I do something wrong in the yogurting process. I've read that eventually the bacterial strains will die out, and I'll have yogurt that doesn't set. But I'm putting this off, by freezing several batch-starters at a time. Meaning that I'm probably only about 8 descendants from my original batch made with the 39 cent container of Yoplait. My yogurt costs me 55 to 60 cents per quart. For our budget, that is dirt cheap. It's March 2019 and I am still using yogurt starter from previous batches. I recently found 3 containers of starter in a 0 degree F freezer, dated June 2017. I successfully made batches of yogurt with that starter. The yogurt is just as thick as my original batches. My hope is that you have as much success with freezing 2nd day homemade yogurt to use as starter as I have. I have not been freezing my starter! I am going to do that! That will save me a lot over the long run, because if I cannot afford to buy milk for a while the starter can go bad, which means wasted food plus buying a new starter. Thanks! It's been very handy, for me as well. I never know when I'll find whole milk at my price point. So, I may go several weeks without making yogurt, or I may make yogurt twice in one week (that happened just this past week, with 2 gallons of milk found on mark down, and no freezer space for the extra gallon of fresh milk). I had no idea that the cultures would remain active after freezing - that's great to know - I was often buying new starter. I stumbled upon that information just before I made my first batch. I was researching everything I could about making yogurt, as I had attempted once before many, many years ago, without success. The frozen yogurt will look very unappealing, when you thaw it. But it still has enough active cultures to set yogurt. Hi Lili! I'm a regular follower of your blog but this is my first time posting. I was wondering.....do you thaw your frozen yogurt overnight in the refrigerator before using? 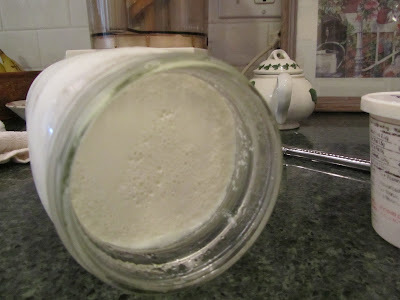 I use powdered milk for my yogurt and it works great! I have however been buying my starter. I would love to use your method! That's a good question. If I think ahead of time, then yes, I thaw it in the fridge overnight. But most of the time, I take a container out of the freezer in the morning, and just leave on the counter for a few hours. It's totally thawed by the time that I need it. Just don't use heat to thaw the starter (microwave or stove). Heat will kill off your active cultures, and render your starter useless. I'm pleased to meet you, Susan. Thanks for commenting. You’ve mentioned freezing the starter before and I’ve been following your example ever since. What flavor(s) of yogurt do you make? What do you use for flavoring? The photo looks like jelly, maybe. Have you calculated how much your dirt cheap yogurt is when you flavor it? We each flavor our own, as we have it. This leaves the plain yogurt still plain so I can use it in cooking, and let's everyone have it their way. For flavorings, it depends on what's in season in our yard or picked in the wild (blackberries), or what I have in the freezer. Blueberry, strawberry, blackberry, plum, raspberry. And you're right, for extra sweetening, we use homemade jelly (red currant or crabapple) or homemade jam (blackberry or plum). I make the jellies and jams with fruit grown here or picked in the wild, and sugar. No pectin, unless I have a flopped batch. So, the cost of the jelly/jam is a couple of cents per serving of yogurt. A 6-oz serving of plain yogurt costs about 10 to 12 cents. So, a flavored 6-oz serving would probably cost about 12 to 15 cents. Has your frozen starter worked well for you? For me, I feel a certain amount of confidence, each time I make yogurt with my own frozen starter. I know that my yogurt was frozen while still very fresh and viable, whereas the stuff in the store could have been sitting there for a long while. Or they could have changed their formula, and it wouldn't work for homemade yogurt. Just suppositions, maybe needless worries. Hi! Thanks for this post. I just froze a bunch of starter, we'll see how it works in a couple of weeks after I use up the starter that's still in the fridge. You mentioned in your post that you also freeze your milk? I've never done that! How do you do it? (Apart from just sticking it in the freezer) Does it need any special prep? Thanks! The only "prep" that you need for freezing milk is to pour off about 1 cup of milk per half-gallon, to allow for expansion during the freezing. Sometimes, milk will separate a little bit during freezing and thawing. I've found that I can shake it up, well, before pouring, and my family has no problems with it. Give it a try and see what your family thinks. Help! I just went through the boil cycle, cooling down now and realize I forgot to thaw my starter. I don't have any fresh yogurt only have a container that's been open for a week, will that still be okay to use? 1) you can thaw some frozen starter in a container sitting in another dish of barely warm water, not hot, just barely warm. Change the water to warm, whenever the water gets too cool. Or, 2) you can try your container that is a week old. It may work. Good luck! Personally, I would go with trying to thaw the frozen starter. You can always reheat the milk to the right temp. thanks for this article. it provides the approach for big cost savings with everyday items. i'll definitely try some of these out in my next cycle of yogurt production. thanks. Since we live out in the country far from markets selling organic yogurt and milk I freeze both. For my starter I found a plain wonderful tasting medium size container, lined muffen pan put about 3 TBS in each then froze. When frozen put in plastic bag. I now have enough starts for several new batches and they take up very little space in freezer.